we did end up going to Oktoberfest yesterday. it was very cold and windy up on that mountain. I was not expecting this, since it was so warm. I shivered a good deal. we mostly hung out w/ Chris' dad and his friends. he has a lot of friends. I do not think I will ever be able to keep them straight. I don't think Chris can either, so I guess it isn't so bad. surrounded by German food, I chose to eat a hot dog and french fries. I am a disappointment to my heritage. I also drank some beer because I didn't want to look lame drinking coke at what basically is a beer-drinking festival. later, Chris and I walked over to the tiny carnival section and drank some hot chocolate, which is much better than beer any day. 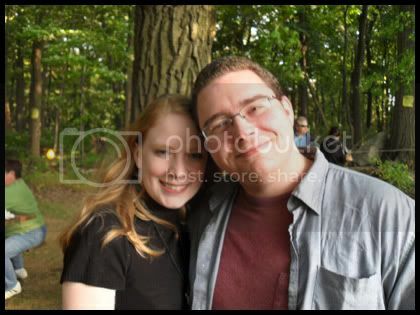 here is a picture of us, taken by Chris' dad. do you know what else we did yesterday? we started packing! all four of the boxes I brought home are now filled with my books, and there are still more books to go. I think, probably, I need more books. I had a terrible time sleeping last night. part of it was that I simply cannot sleep through a night ever. I always wake up at least once, but usually it is more like three times. last night it had to be at least eight. part of it was all the weird dreams I kept having. I had one where Chris had worms living in his neck. they had gotten there from some sausage he had eaten (yeah, I don't know either). he denied their existence and got offended when I didn't want to get anywhere near him. I could see them under his skin; it was disgusting. so then I woke up and it was around 4:00 am and I went back to sleep. in this dream I was back in school and had to take a test in a class I hadn't attended for the entire year. it was a different dream, but I was still concerned about the worms in Chris' neck (even though he wasn't in this dream). so everyone was like "oh no, the test!" and I was all "who cares? there are worms in Chris' neck!" and they, of course, had no idea what I was talking about. it was really weird. I am in the process of making a Halloween cd. Chris doesn't understand this, he says there is no such thing as Halloween songs. if he had actually ever been a child, he would perhaps have watched the Disney Halloween special DTV Monster Hits. then maybe he would understand. my compilation will consist largely of these songs, with the addition of some others. when I get a final playlist made up, I will post it here. because I know there have to be other people out there who are my age and looking to relive the childhood glee of Halloween.